Click any of the boxes below to navigate to your section of choice. A while back we wrote an article titled ‘Video Content, Personal Branding For Creatives: A Storytellers Survival Kit‘ to which this article serves as a Part Two. The first translates content marketing for a creative/artistic audience and explains the importance of owning a personal brand that is an accurate representation of ones merit and aspirations. In it we stress the effectiveness of quality video and visual storytelling for engaging, and staying in the periphery of your audience. We took a look at the award winning film Tangerine and laid out much of the gear that director Sean Baker used to make the hit film. This time around we will deeper explore iPhone filmmaking and take a look at a vast selection of iPhone filmmaking products that will allow you to level up your smartphone video production to get you creating quality, creative, engaging and inexpensive videos. Take a look at some of our favourite iPhone movies and videos below before we dig into the tools these talented filmmakers used to create them. ‘The Painter of Jalouzi by Ryot Studio filmed on a iPhone 6s using a collection of SLR lenses. Robot Koch feat. Delhia de France ‘Dark Waves.’ Filmed on iPhone 6s Plus, additional gear by Watershot, Beastgrip & Olloclip. Edited & finished in Davinci Resolve. The Official movie trailer for the full length feature film Tangerine shot on an iPhone using FiLMiC Pro. 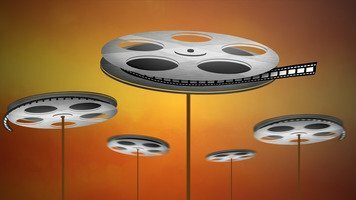 Apart from a compelling story or message, many would argue that sound may be the most vital ingredient to a successful film production. Many errors with the visual content can be edited and fixed in post production but poor quality audio is quite hard to enhance if the original source is not clearly captured. It will make everything you do appear much less convincing. Quality audio encourages the audience to excuse most of the visual errors as it allows them to easily follow the story or narrative. While shooting quality videos on a smartphone is completely feasible, it poses several problems when capturing audio. The biggest problem when shooting using an in-camera microphone is that it is very close to the filmmaker and not the source of sound. This means that you are likely to pick up much unwanted noise from the environment and risk losing some from the subject. In this case, you want to consider using a separate microphone. 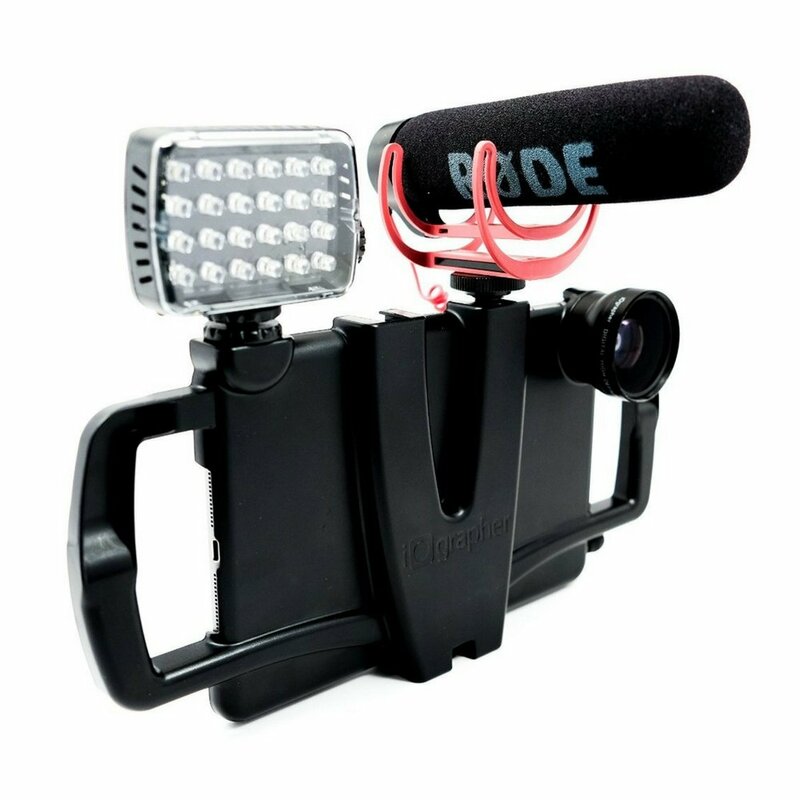 There is a wide variety of iPhone microphones that will produce great results for your film. You need to determine which sounds are needed in your production, which ones are not, and which microphone has the features best suited to help you achieve the results you desire. In addition to your high quality microphone you are going to need a professional recording app. 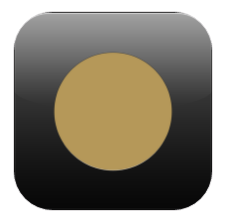 Some microphones may have their own dedicated audio recording app, such as the Zoom iQ6 & iQ7. These apps allow you select the sample rate, set audio levels and edit your audio to be synced up with your footage in post-production. When choosing a microphone you will want to consider the input connection as there are advantages and disadvantages to each option. Microphones that connect to your iPhone or iPad via the headphone jack are great in that they require little to no power from your device. However they are often less versatile, less sensitive, and contain cheaper components. The larger cardioid and condenser microphones that connect via the Lightning connection will draw their power from your iOS which of course presents several problems. However, they certainly have more features, are well constructed, and capture a wider frequency response at a higher bit rate. 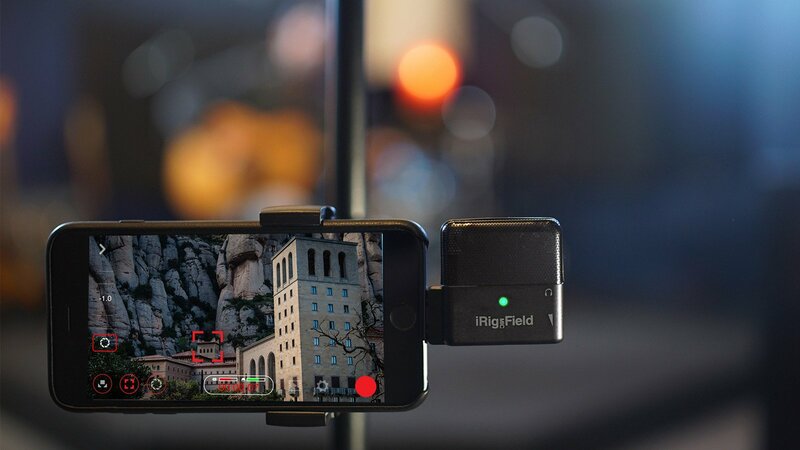 If you are creating video on the go, performing interviews, livestreaming, etc. then you’ll do just find with a device powered microphone. 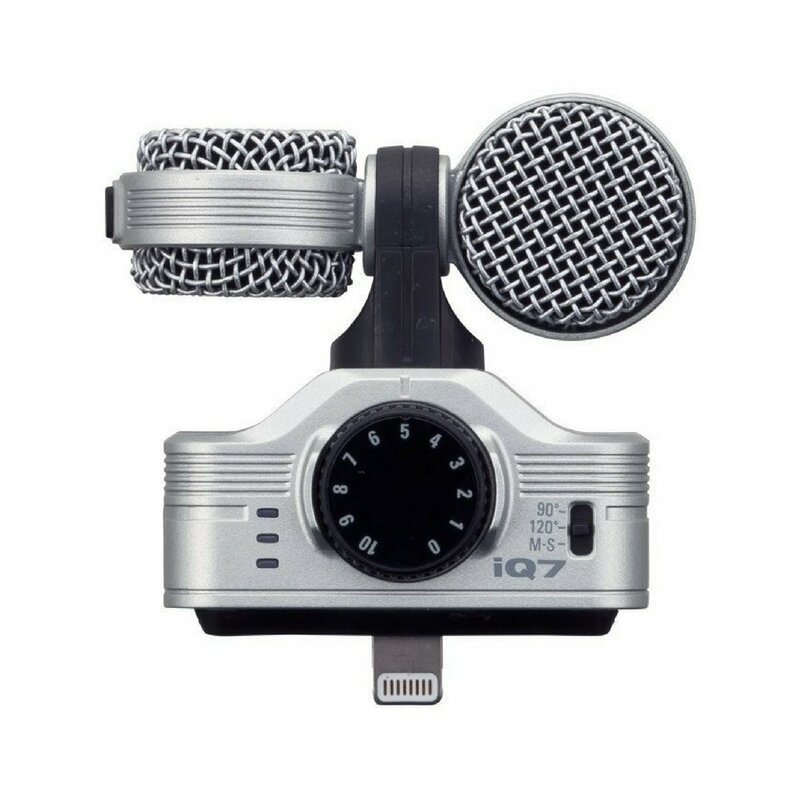 If your looking to elevate the quality of your content or enter the wonderful world of filmmaking then we would highly recommend purchasing an exterior microphone such as the Zoom H6 6-Track Recorder. Zoom iQ6 & iQ7 – Outstanding stereo condenser microphones that are compatible with all iOS devices with a Lightning connector. They can also be used with any video camera when using the free Handy Recorder App. The Zoom iQ series allow your to produce high-quality recordings on the go while remaining small, lightweight and compact. 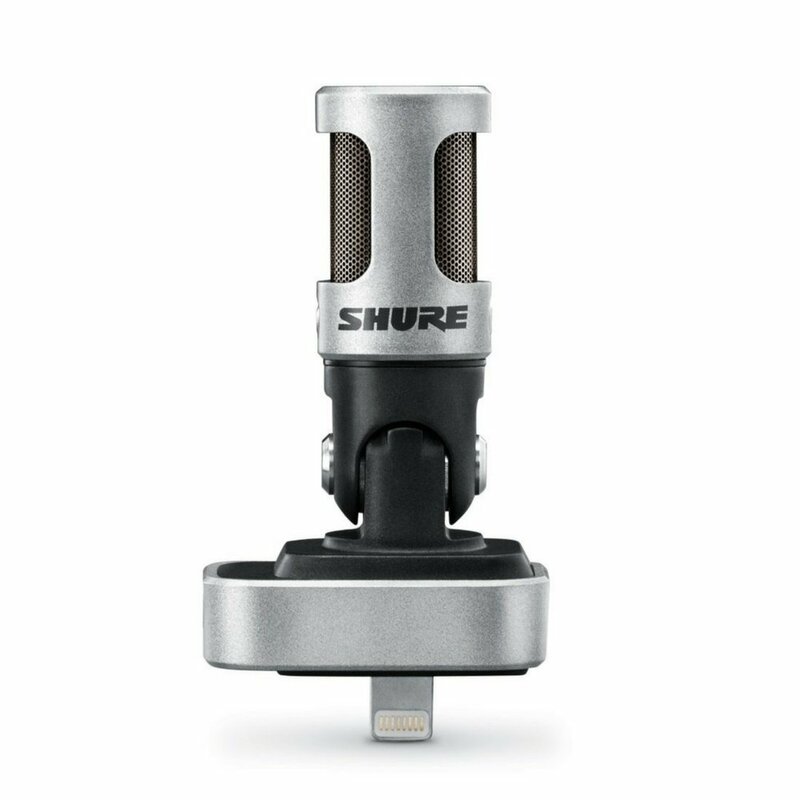 Shure MV88 – Offers superior audio quality of all iOS recordings. This matched cardioid and bi-direction microphone features a mid-side architecture producing a wide stereo image and preset modes which automatically adjust EQ, compression and limiting to Speech, Singing, Flat, Acoustic and Loud recordings. Record up to 24-bit 48 kHz for top results. 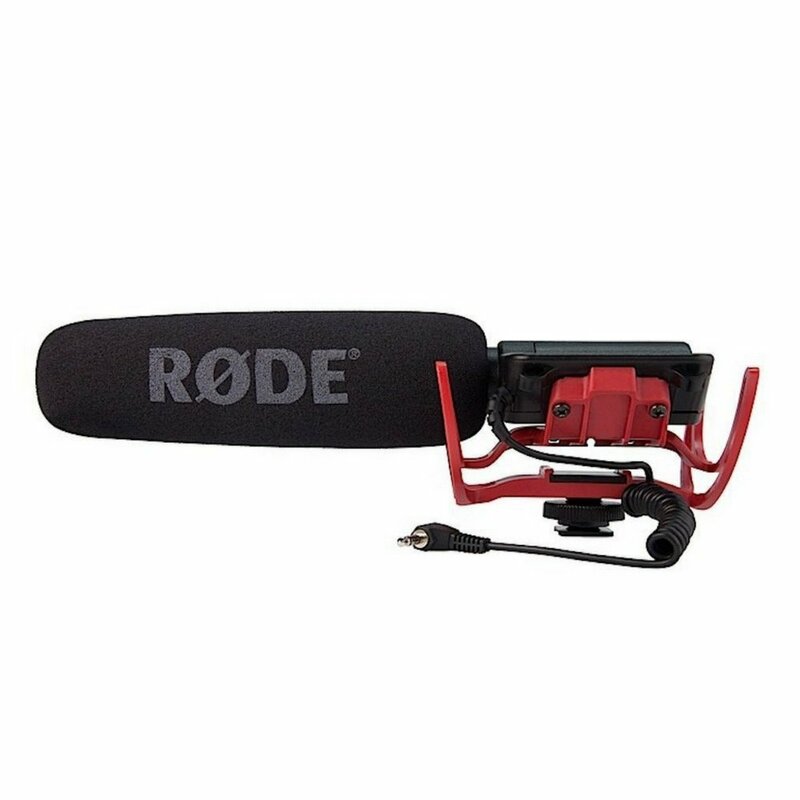 Rode VideoMic Me – A high-quality TRRS cardioid directional microphone designed for all smartphones. It features a headphone jack on the rear of the mic to listen to audio while recording and through playback. Included is a windshield to block out unwanted wind that may come from the environment or close vocal recording. Apogee MiC 96k – This is a high quality cardioid condenser microphone designed for capturing vocal and acoustic instrument recordings. An excellent choice for podcasts, voice overs, and beginner musicians. The microphone is powered by connection to an Apple device via Lightning or USB cables. 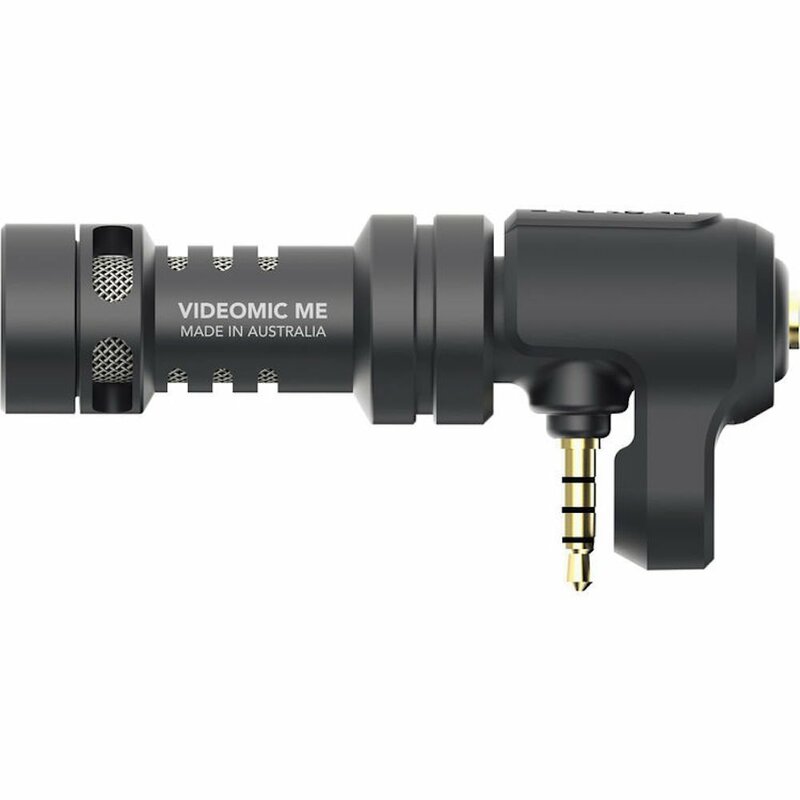 Rode Videomic Shotgun Microphone – Here we’ve got the big brother of the VideoMic Me. 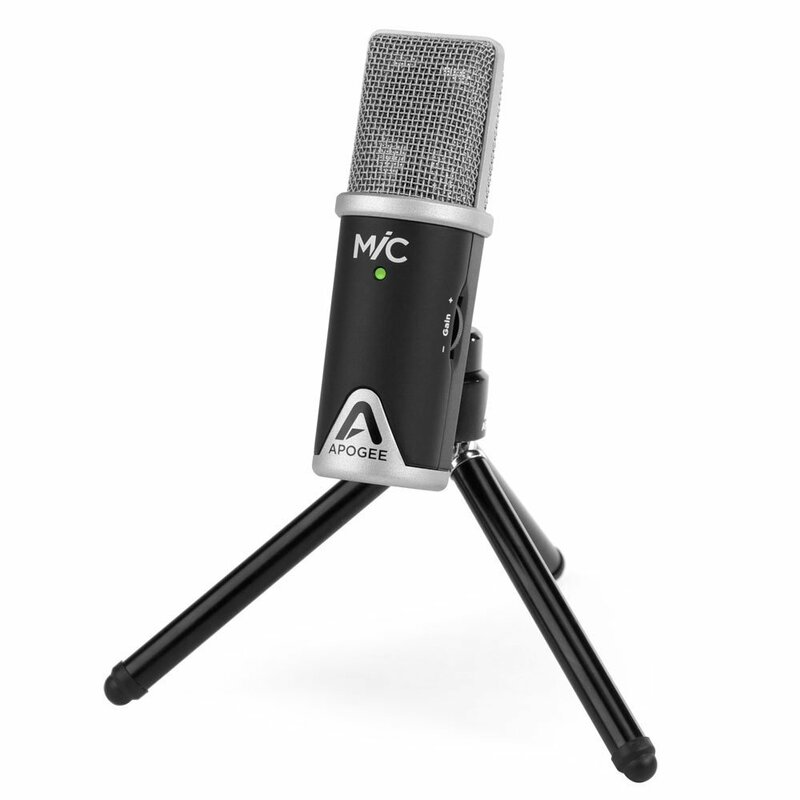 It offers studio recording quality through its super cardioid polar pattern. Avoid rumbles and noise with its Rycote Lyre shock mount and a High Pass Filter to roll off some of the low end frequencies. It includes a windshield and an integrated cold-shoe mount to attach to a filmmaking case. Lavalier Lapel Omnidirectional Condenser Microphone – Omnidirectional condenser lapel microphone is designed for all smartphone recordings and captures a noticeably clear and accurate take of your audio. Its picks up sound from all directions and is an essential tool for self-broadcasting creatives and entrepreneurs. 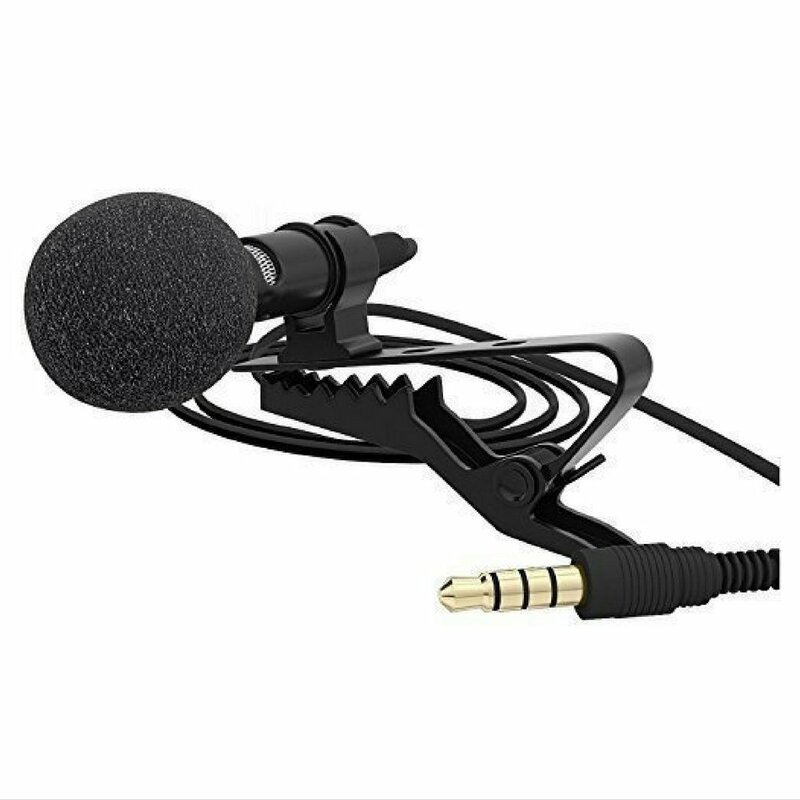 Miracle Sound Lavalier Condenser – Connect this mic to any iOS and smartphone device to capture a high-quality audio recording with zero effort. 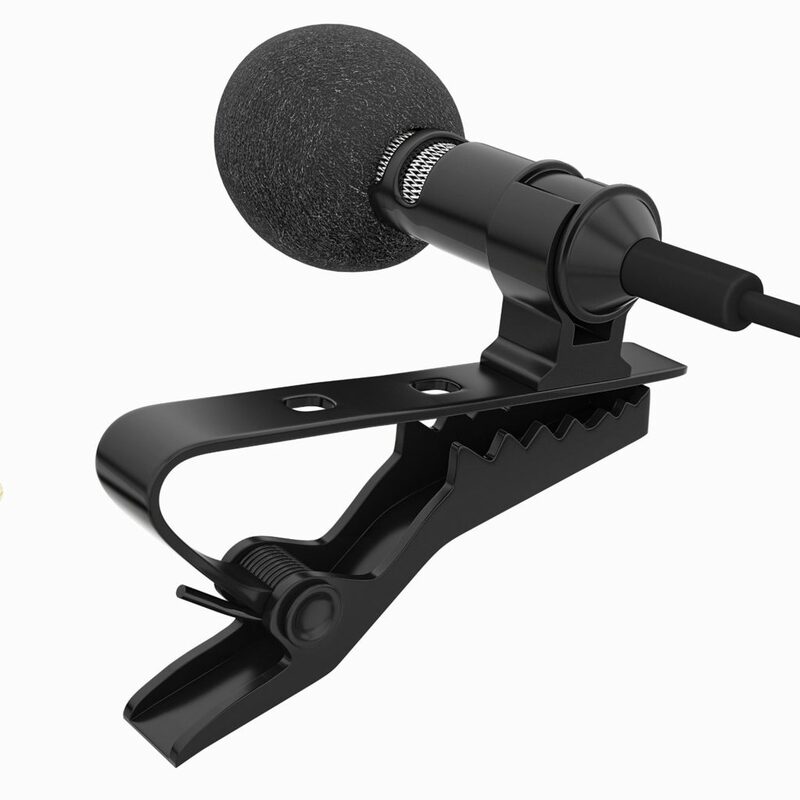 The microphone is omnidirectional making it a great choice for close up professional recordings as well as capturing sounds from your environment, great for recording keynote speeches and presentations. 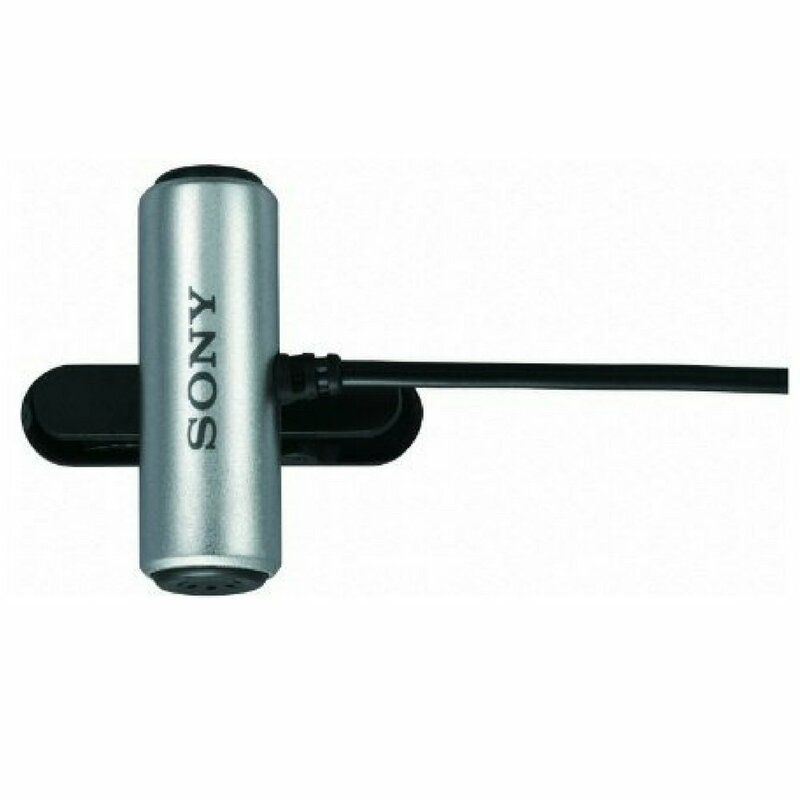 Sony ECMCS3 – A high-selling cavalier microphone and outperforms many others of its kind with it’s much louder output volume. The microphone is stereo and rotates for flexible placement which makes it great for conducting interviews as well as livestreaming, social media, tutorials, webinars and plenty more. Lavalier microphones are a great choice for dialogue rich scenes, and scenes shot from a distance that include much dialogue. They are small, clip on to the speakers shirt in both wired and wireless models, and are widely used by vloggers, video marketers, in interviews and presentations. Variations of the lavalier microphone offer directional, omni-direction or stereo recording which may be ideal or detrimental to what you are shooting. Consider this when deciding whether or not to capture sounds in your environment. Typically lavalier microphones can perform poorly in windy outdoor scenarios so try using them in more controlled environments. Position a lavalier microphone around 6-8 inches from your mouth and central to where you will be directing your voice. You may clip it on to your shirt or hide it underneath in a number of ways designed to avoid wind and the rubbing of clothing. A common technique is to equip the talent with a lavalier microphone while simultaneously rigging your camera with a shotgun microphone and layering the two takes together in post. Shotgun mics can be attached to most mobile devices with the use of a case. The cases we have listed further below offer attachments found on more expensive cameras, giving you the same options of professional video cameras for your smartphone. Shotgun microphones are an excellent choice for close up recording of your subject or for capturing the environment that surrounds it. If you plan on recording outdoors in a windy environment, apply a wind screen (also called a Dead Cat) over your shotgun mic as to avoid harsh noise it will otherwise surely pick up. These can be purchased or inexpensively homemade. It is very likely that you have seen some incredible video or photography while having zero idea that it had been shot with an iPhone. It is probably more likely than not that what you saw had some help from a few third party accessories, specifically some brand of attachable lens. The iPhone’s camera is great for capturing candid moments with ease but they obviously lack the versatility of professional DSLR cameras. This need for versatility has opened a brand new market for independent artisanal manufacturers to create high-quality lenses, many which bare extraordinary results. iPhone cameras offer a digital zoom which is a not necessarily a “zoom” but an enlarging of the image toward the centre of the frame resulting in a poorer quality image. By attaching a lens you’ll be able to achieve stunning results that will allow you tell your story with more impact and variation while giving a professional touch to your work. olloclip Telephoto & Ultra Wide-Angle – Attaching easily to any both front and rear cameras, the olloclip gets you 2x closer without degrading the quality of your image or ultra-wide with a 155° field of view. Fits over any iPhone 8/8 Plus & iPhone 7/7 Plus. olloclip 4-IN-1 – The olloclip 4-in1 includes versatile Fisheye Lens, Wide-Angle and Macro 10x & 15x Lenses that offer a unique and premium mobile filming experience. 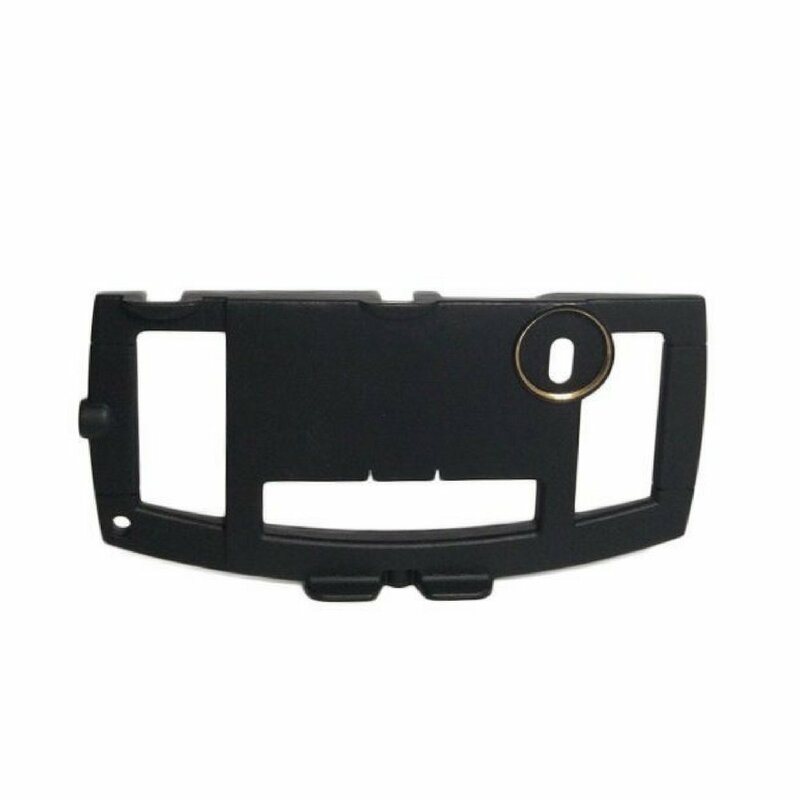 Their compact design clips on your iPhone 6/6 Plus & 6s/6s Plus on both front and rear cameras. 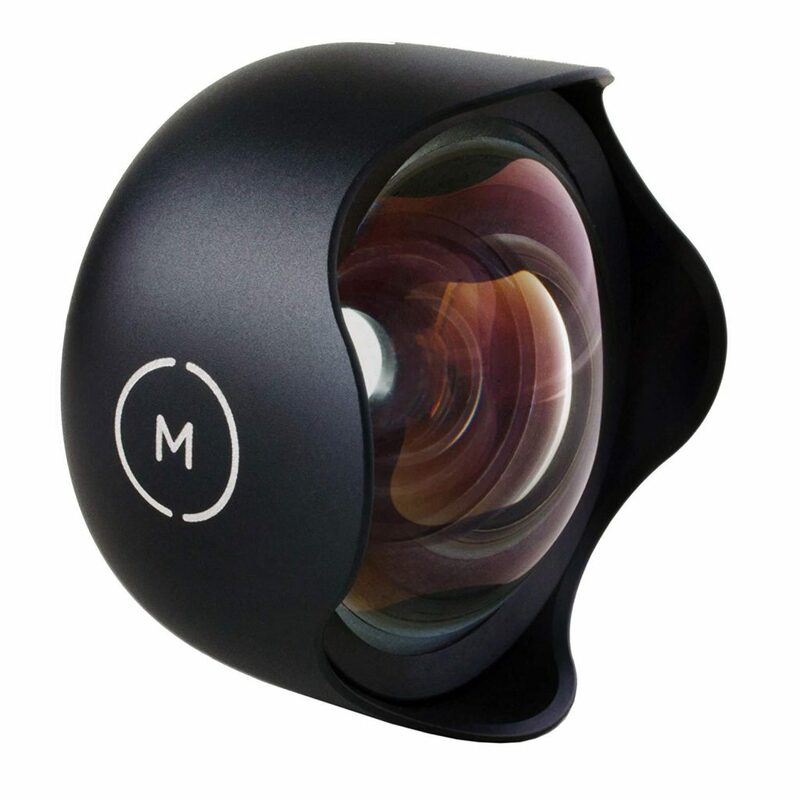 Moment Wide-Angle Lens – Moment Lens build premium quality smartphone lenses from premium cinema grade glass. Capture epic landscapes and tight interior shots with no distortion. 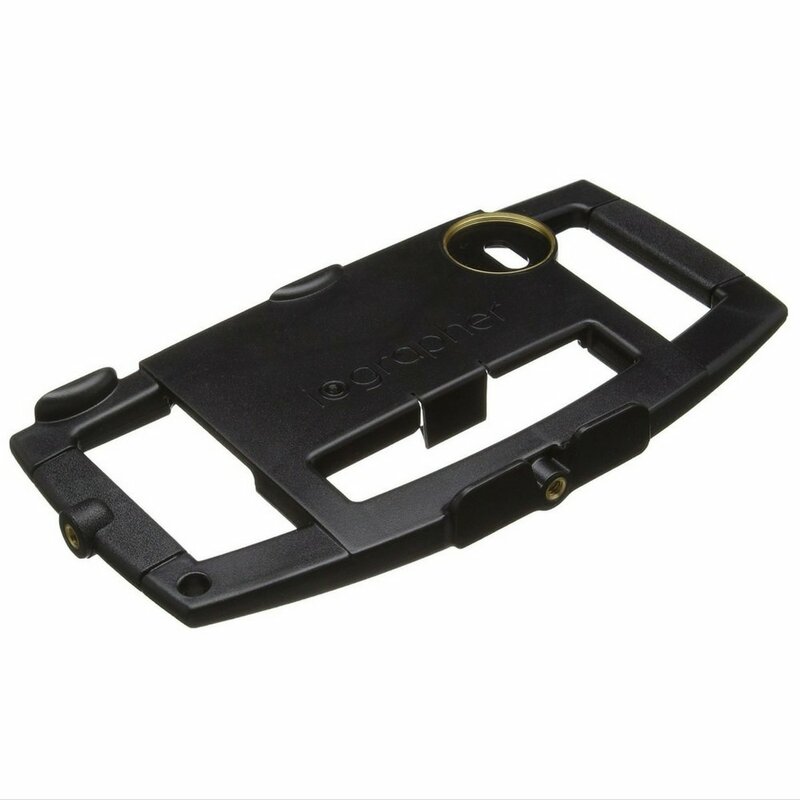 The lens attaches to your phone with a mounting plate to your selected choice of Moment Cases. 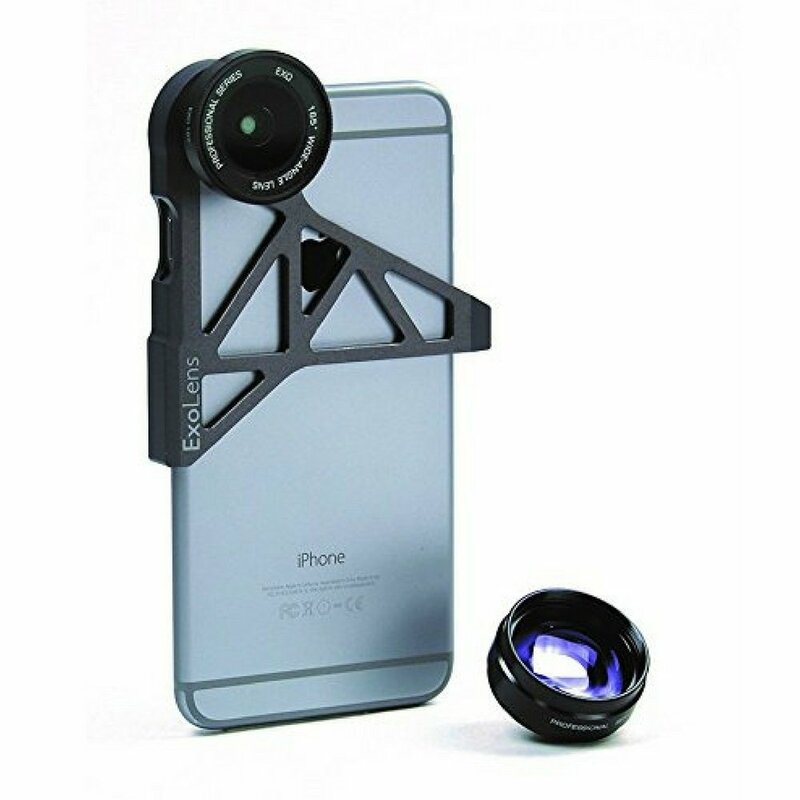 ExoLens 2 Lens Kit for iPhone – The ExoLens 2 will transform your iPhone 6/6s Plus into a mighty videography tool with interchangeable Super Wide Angle (165) & Telephoto (3x) lenses. It’s aluminum composition includes an integrated tripod and selfie stick mount. Amir 3-in-1 Lens Kit – An affortable best-seller. 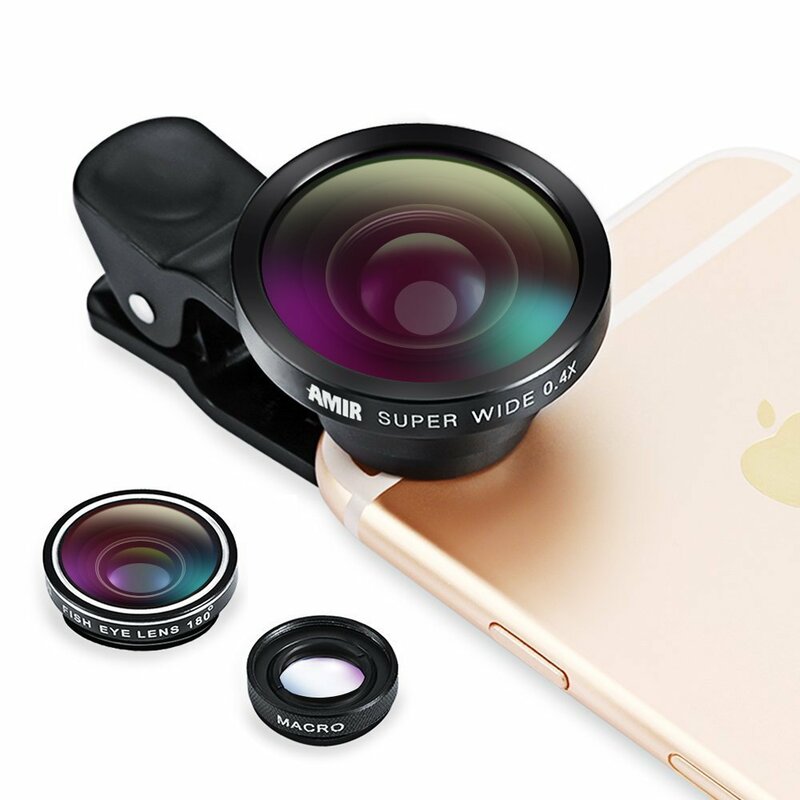 Connecting to a wider range of smartphones is the Amir 3-in-1 HD camera lens kit which offers a Fisheye lens (180°), Super Wide Angle (140°) and Macro (10x) lens of high professional clarity. 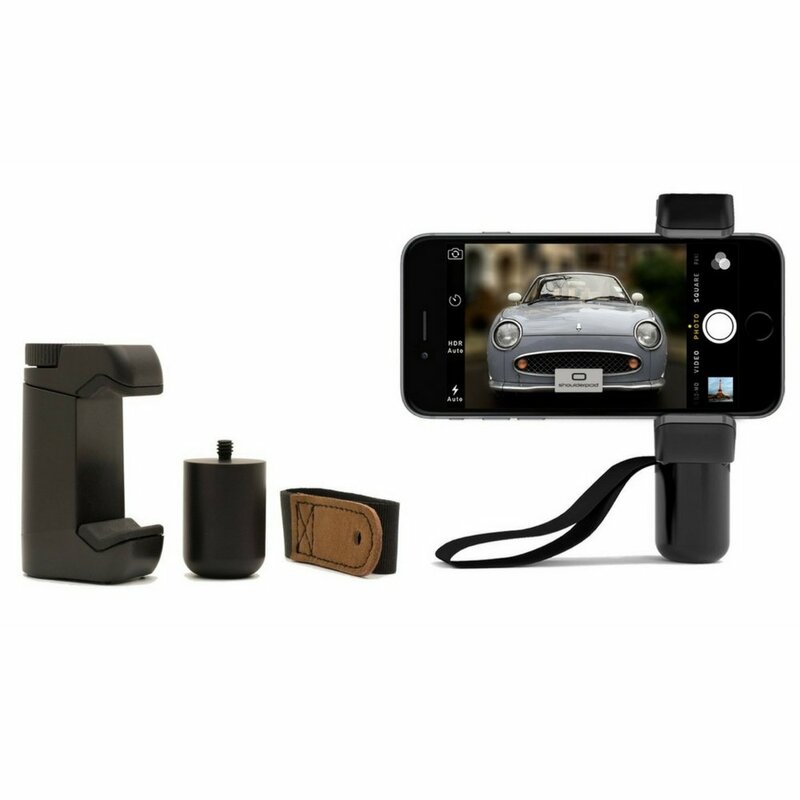 Clip the Amir 3-in-1 to the front or rear cameras and enter a higher realm of smartphone photo/video. CamKix Camera Lens Kit – One of our favourite lens kits of all. 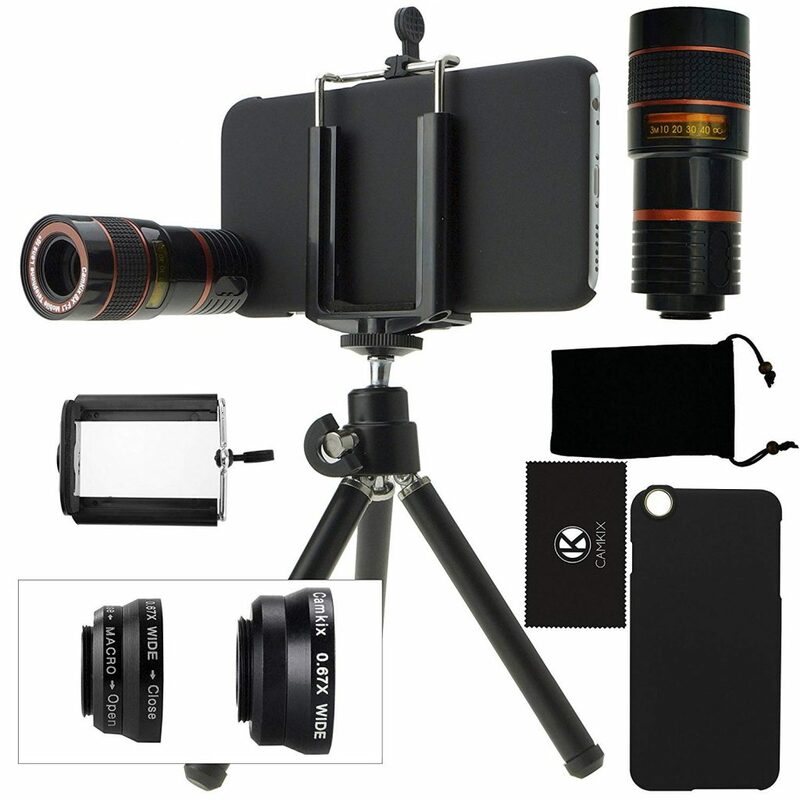 CamKits includes an 8X telephoto, fisheye, macro and wide angle lens along with a mini tripod with extendable legs. 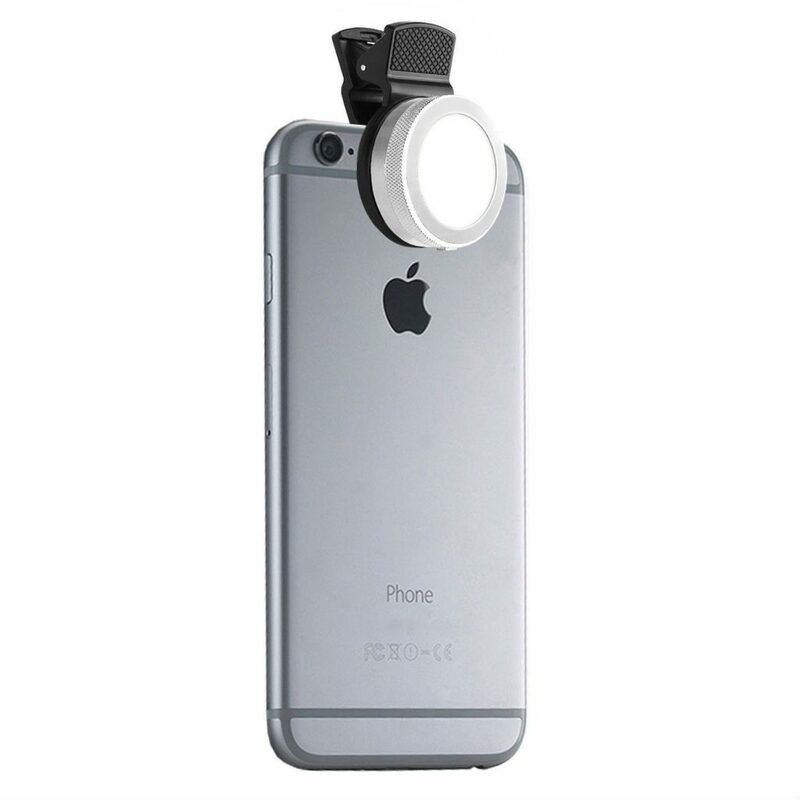 Simply screw a lens into the case provided suited for the iPhone 6/6S. Though the case doesn’t support other sizes of iPhone, the holder is Universal and can multiple devices. Keep your lenses clean with the cleaning cloth, store them in a velvet back and pack all the contents in a hard case. Everything included. 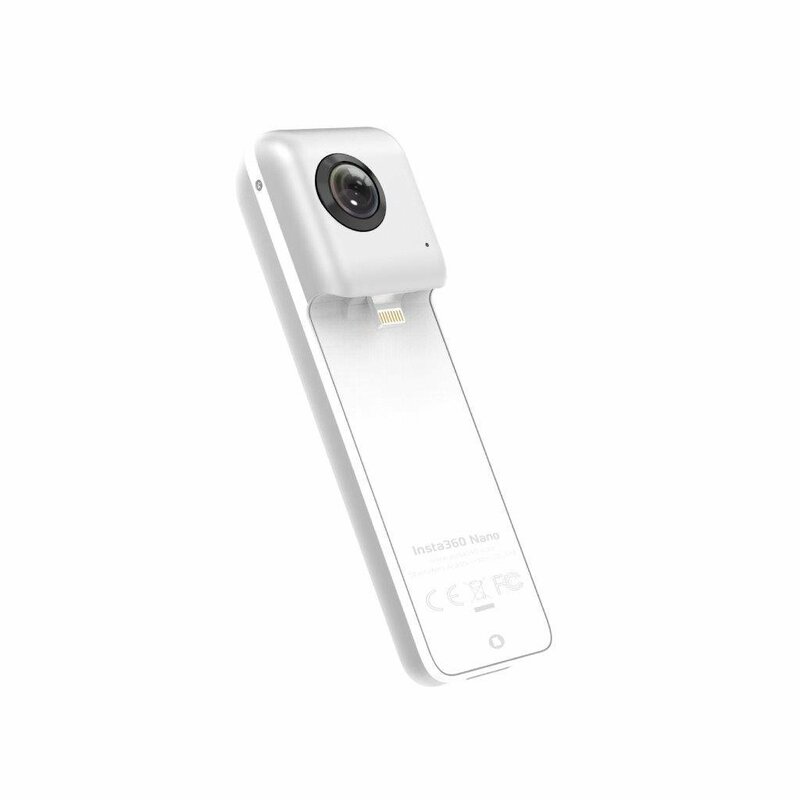 Insta360 Dual Lens Nano VR Camera – Excellent choice for travel bloggers, live streamers, partiers. The Insta360 is a 360 degree camera that attaches to your iPhone 6/6S-6 plus/6S plus and allows real-time video and photo sharing. Designed with a mini spherical camera, the Nano transforms your iPhone into a virtual reality machine with 64GB storage capacity. Share your experiences from all angles. iPro Lens System Trio Kit – iPro manufactures premium grade lens kits fit for almost all models of the iPhone so be sure to choose the kit suited for yours. 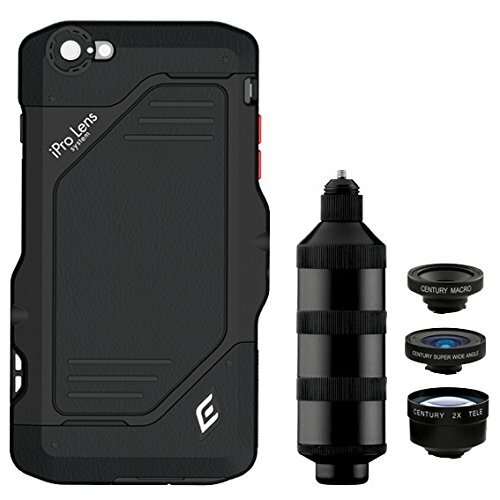 Included is a durable case to which you simply screw on your choice of a 2X telephoto, super wide-angle, or macro lens. Though iPro kits sit at a higher price-point than some of the other kits on the market, the results are stunning and justify the cost. Wide Angle lenses are essentially “zoomed out” lenses that capture more of a scene than the human eye can focus on. They are useful in emphasizing the difference in size or distance between objects in the foreground and background where closer objects appear larger and distant objects appear smaller. Do note that in providing an expansive background, straight lines near the edges of the picture can sometimes end up looking slightly curved. Generally, wide angle lenses are very cinematic and produce powerful and professional results. Fisheye lenses offer an over-exaggerated expansive landscape with some lenses capturing up to 180-degree field of view. This creates an extremely panoramic curve around at the edges of your footage but can be a very pleasing effect that adds much character to a scene — they are unique for the very obvious convex characteristic. That being said, avoid shots with straight lines of perspective as these certainly will come out distorted. As you’ll immediately recognize, fisheye lenses are very popular for filming extreme sports as they give much emphasis on the very centre of the frame. Macro lenses are used for close-up footage producing huge amounts of detail. They are an excellent tool for drawing attention to magnificent details of ordinary things, making them popular for filming wildlife and agriculture. With reproduction ratios of at least 1:1, subject matter in a macro environment show life size or greater. Anamorphic lenses are a form of wide angle lenses but differ in that they have a vertically oval-shaped hole which captures often up to 2x the amount of vertical information than other spherical lenses. The tall image is then stretched horizontally, creating a wider aspect ratio which has long been popular in the film industry and is why we consider the effect they give to be so cinematic. Always be sure to thoroughly clean your lens before each use as to remove all smudges, fingerprints and microfibres. These have the potential to ruin perfectly good footage beyond repair. 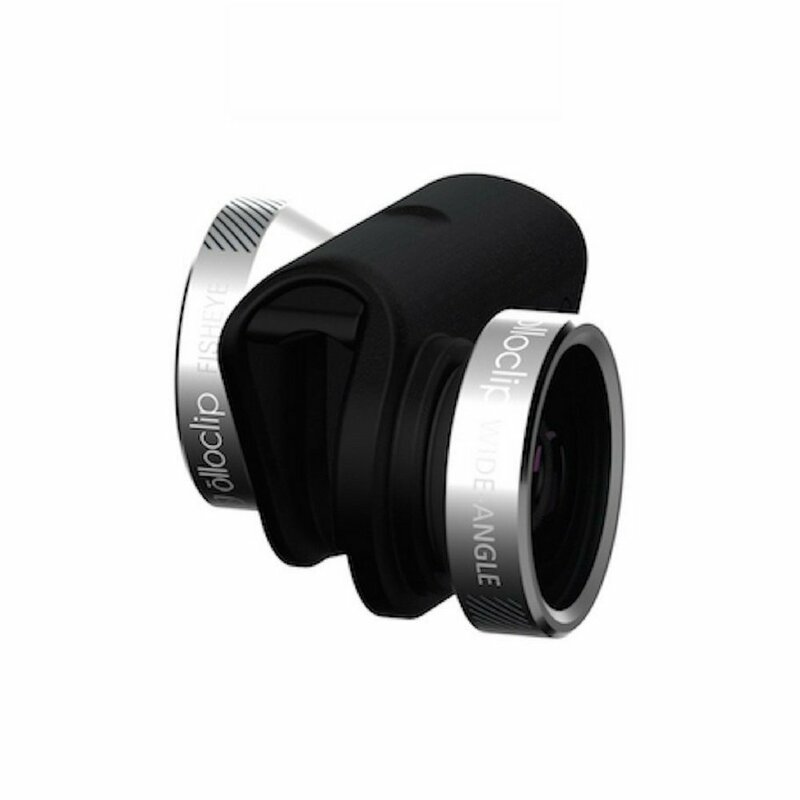 Moondog Labs have developed a collection of 1.33X anamorphic adaptor lenses that work flawlessly with the various sizes of iPhones. Their precision anodized aluminum and all glass adapter enables wide format imaging, subtle distortions and organic, horizontal flares seen in Hollywood feature films. They preserve the full resolution of your iPhone camera while creating 2.4:1 aspect ratio video and panoramic 16:9 still images. Nobody is impressed with shaky footage unless it is intended and that goes without saying. Yet somehow, so many influencers, brands, and publishers release tons of horribly produced content that, with only a little investment, could have so much more impact. Soon enough clean footage will be the norm as the tools to create it are cheap and easy to use, so you may as well get started now. 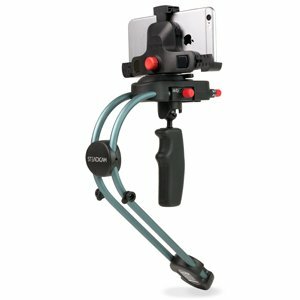 For filmmakers and creatives on the go, a quality smartphone stabilizer will play an essential roll in elevating your productions into the realm of the professional. Quickly and easily swivel your camera around while capturing smooth action footage from a variety of heights and angles without putting stress on your body or compromising the shot. ​For those creating video content for their personal brand, we would suggest never leaving home without a iPhone stabilizer, microphone, collection of lenses, a clip-on light, and a mini iPhone tripod. These are all extremely lightweight, compact tools that allow you to create quality content consistently. Creativity and opportunity can strike at any moment so don’t settle for making cheap “stuff for the sake of making stuff.” Make excellence your standard and stand out. Determine the best place to position your smartphone. Consider things like the content and activity in the background, the lighting and noise. Be sure to place the camera horizontally for filming video and held at an appropriate height as to portray the subject as you wish him/her to be understood. For example, having the subject look ever so slightly down at the camera can help establish dominance and authority while looking up may project weakness and submission. Feiyu G4 Plus 3-Axis Gimbal Stabilizer – If you’re looking for a premium stabilizer for a large screen smartphone (from 5.5cm-8cm) then check out the Feiyu G4 Plus. 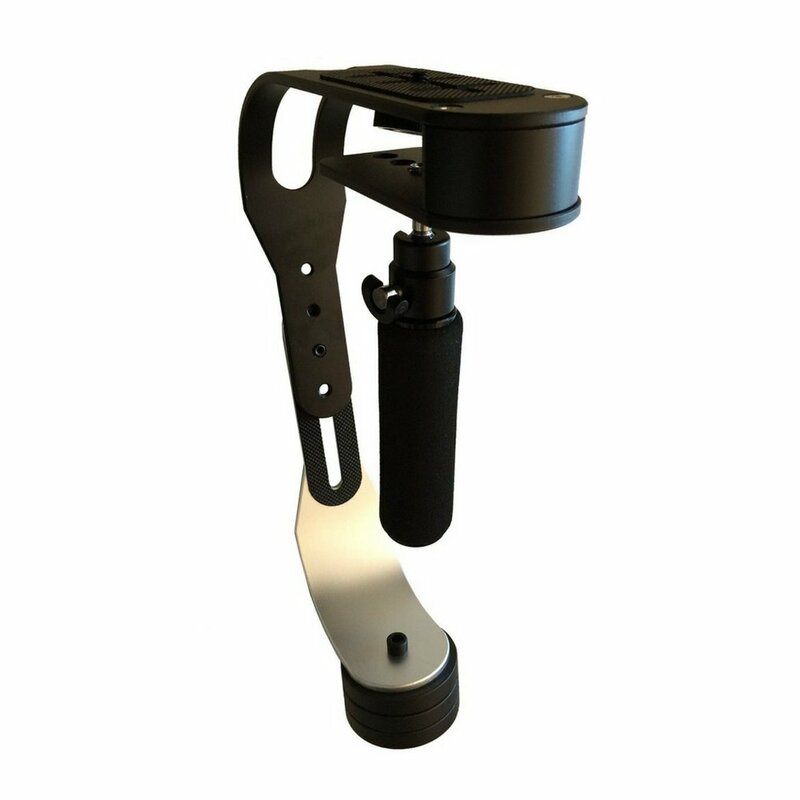 It’s hand gimbal incorporates a high-quality 3-axis stabilization technology into a well-constructed light-weight aluminum body. It has a Vertical Tilting Angle of 320°, a Rolls Angle of 100° and Horizontal Panning Angle: 320°. Included are a remote control and all connecting cables and batteries to connect to all essential devices. 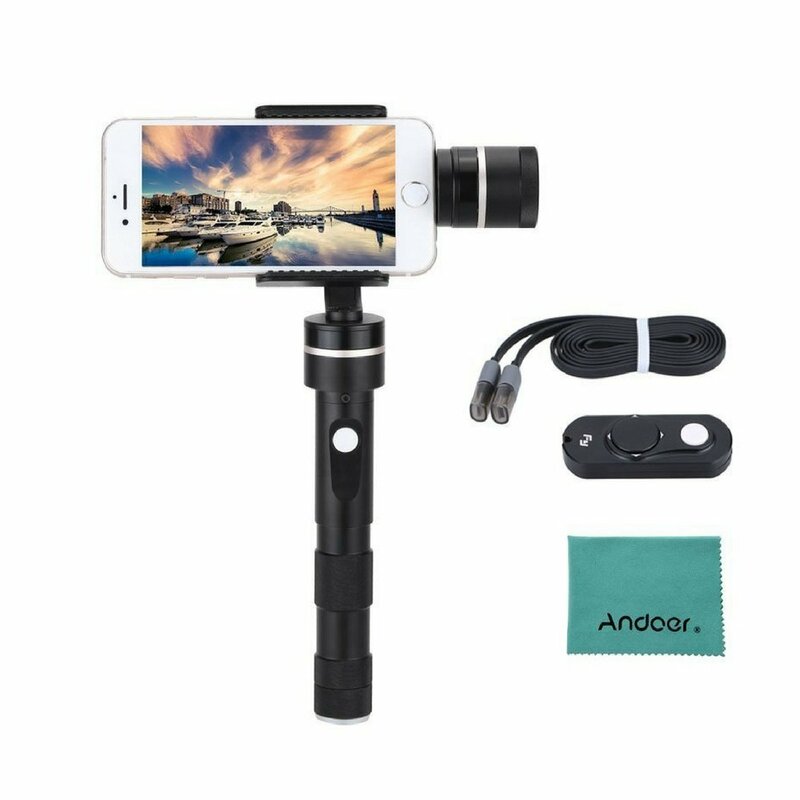 Shoulderpod S1 Professional Smartphone Rig – Avid smartphone filmmakers and photographers love Shouldpod’s beautifully crafted products. The S1 features a Tripod Mount, Filmmaker Grip, and Traveler Stand, essentially tools for photographers, filmmakers, journalists, and travelers. Adjustable rubber pads make the S1 compatible with all models of smartphones with a width between 48mm and 93 mm. Steadicam Smoothee – Already a classic in the new world of smartphone filmmaking. It features a universal removable smartphone adaptor for all modern models of smartphones along with a mount which can be used as a tripod adaptor. The Steadicam Smoothie is extremely straightforward to use. Included is a gimbal which allows for seamless pan and tilt action, allowing the creation of cinematic style footage free of shakes and bumps. The Roxant Pro Video Camera Stabilizer – The Roxant Pro features superior design and construction with professional stabilization. Use the Roxant Pro on any camera up to 2.1lbs including DLSRs, video cameras and of course, smartphones. Get clean, smooth footage while running, biking, skating, climbing stairs, etc. The feature film look you get from the Roxant Pro make it an excellent choice for indie filmmakers, journalists, athletes, and creatives on the go. 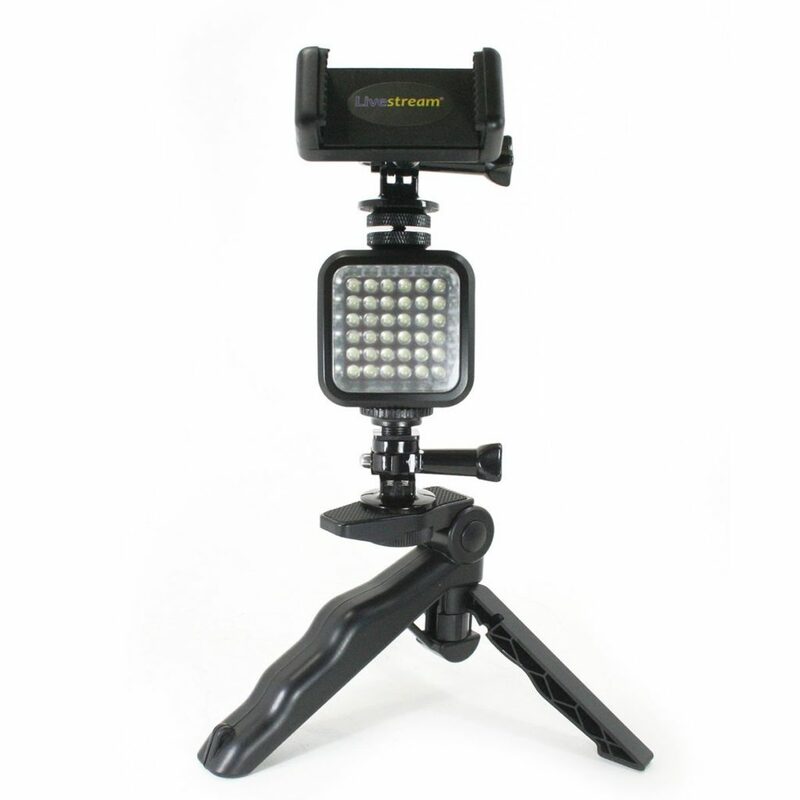 Livestream Gear LS-LED Video Light with Tripod – An excellent combination of gear. The Lifestream LS-LED Tripod features a rechargeable light that is power-efficient, perfect for live streaming of Meerkat, Periscope and Facebook. 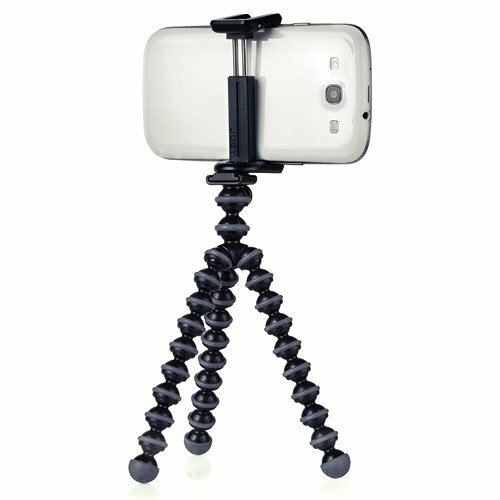 Use Livestream as a handheld device or unfold the legs to use as a tripod. It is fully DLSR and GoPro compatible so is sure to go a long way in your content creation toolbox. Included are an LED Light, Rechargeable Battery, GoPro Screw Adapter, 2x tripod adapter, phone clamp, and Hot Shoe Adapter. 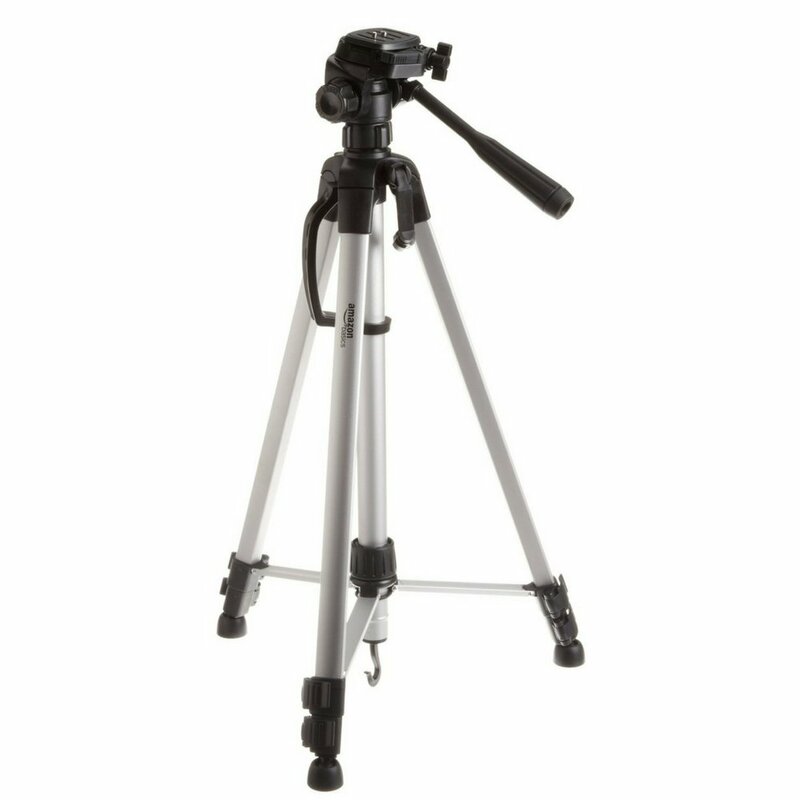 AmazonBasics 60″ Lightweight Tripod with Bag – This lightweight adjustable-height tripod is outstanding value at an extraordinary price. Capture portraits or landscapes with most cameras of up to 6.6lbs. It features built in levels that let you know when the base and camera plate are level and comes with a handy carrying case. It weighs only 3lbs and can extent from 25” to 60” at full extention. A quick-release mounting plate facilitates rapid transitions between shots, though do note that smartphone adapters are not included. Camkix Universal Adjustable Tripod + Bluetooth Remote – Compatible with most smartphones and tablets is the popular Camkix adjustable tripod and Universal Bluetooth Remote Control. It comes with a dual mount phone holder allowing you to position your phone vertically or horizontally. Pair the remote with your smartphone or tablet just once, select a camera app you which to use and you’re set to capture image and video from a distance of up to 30 feet. Adjust the length of the tripod from 2.7” up to 6.25”. While stabilizers and tripods are great for so many uses, a good iPhone case will allow you to attach a wide assortment of accessories to your device that you would otherwise need additional crew to hold for you. The selection we have chosen here are the iOgrapher series and the Beastgrip Pro which are premium brands offering all of the necessary connections for you to move efficiently move around, light up and mic your talent, all in one compact instrument. 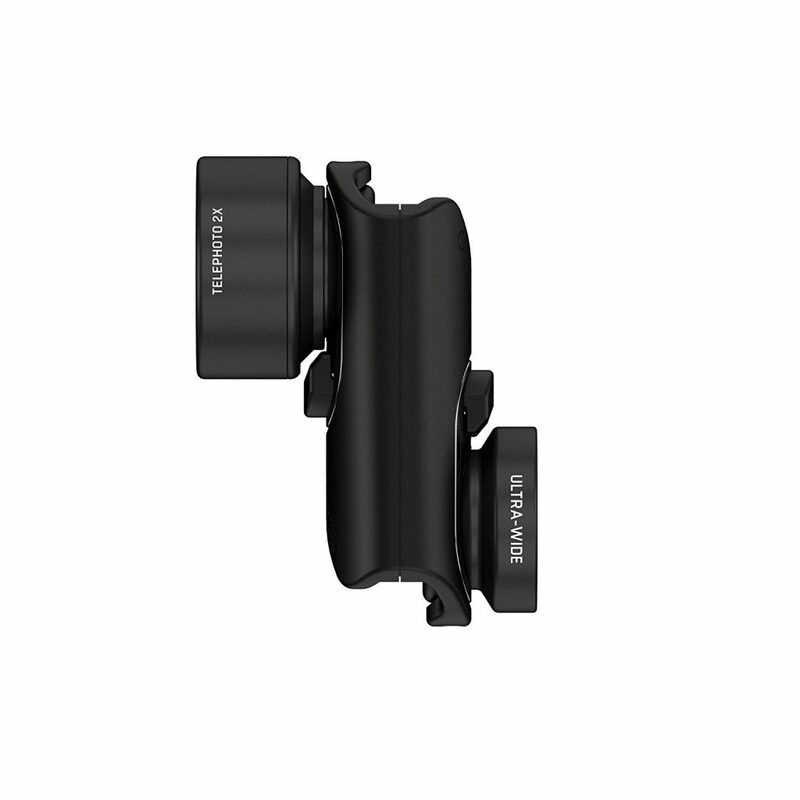 ​With the use of a Turnikit lens adaptor you can easily connect any DSLR lens to your iPhone film case. Attach your case to a tripod, stabilizer or hold it by its grips and transform your iPhone into a high quality feature film making beast. Be sure the model you choose is the appropriate size for your phone and whoever else on your team. Some models are universal and will fit all sizes of modern smartphones. iOgrapher Filmmaking Case – iPhone 6/6 Plus – Quickly get your device in and out of the iOgrapher with an easy clip system. Connect to any tripod vertically or horizontally with using its 1/4 20 thread on the sides and get great footage for your filmmaking, livestreaming and photography. A 37mm lens thread allows you to connect 2 cold shoes, lenses and attachments at the top allow for audio and lighting devices. Suitable for iPhone 6/6 Plus. iOgrapher Filmmaking Case – iPad Mini – Turn your iPad mini into a filmmaking powerhouse with the iOgrapher Mobile Media Case. Made from high grade polycarbonate/ABS blend, the iOgrapher is extremely tough and durable, and can stand up to any shooting environment. Add a 37mm lens for wide angle, fisheye or macros shooting. Attach lighting and audio gear using the three accessory mounts at the top of the case. 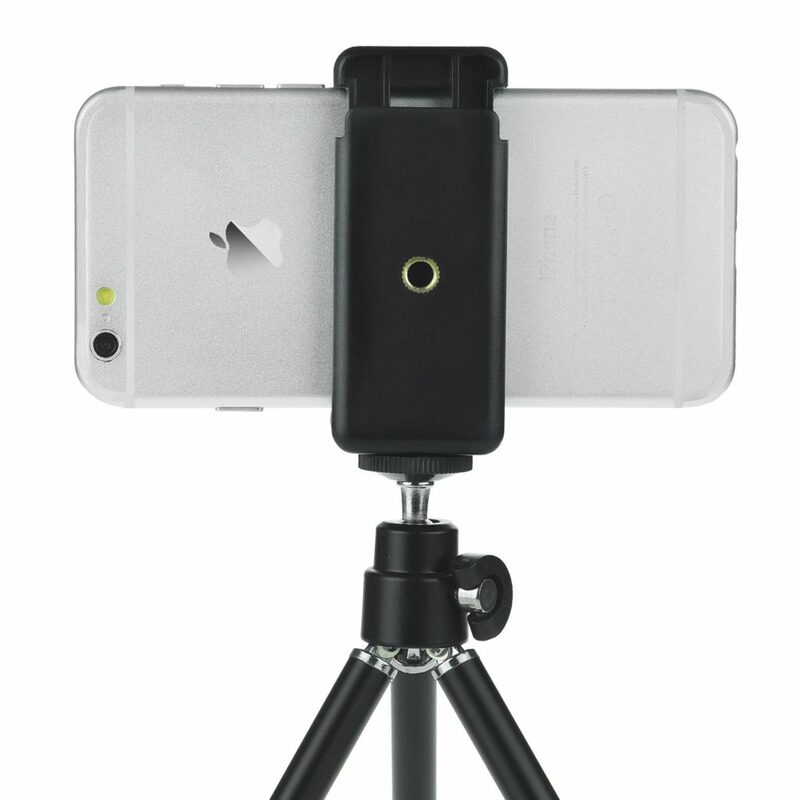 Then attach the iOgrapher to any tripod for continuous workflow. 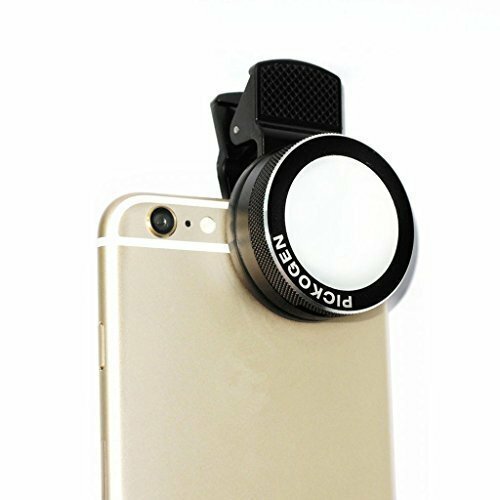 iOgrapher Filmmaking Case – iPhone 6/6S – Quickly get your device in and out of the iOgrapher with an easy clip system. Connect to any tripod vertically or horizontally with using its 1/4 20 thread on the sides and get great footage for your filmmaking, livestreaming and photography. A 37mm lens thread allows you to connect 2 cold shoes, lenses and attachments at the top allow for audio and lighting devices. Suitable for iPhone 6/6S. 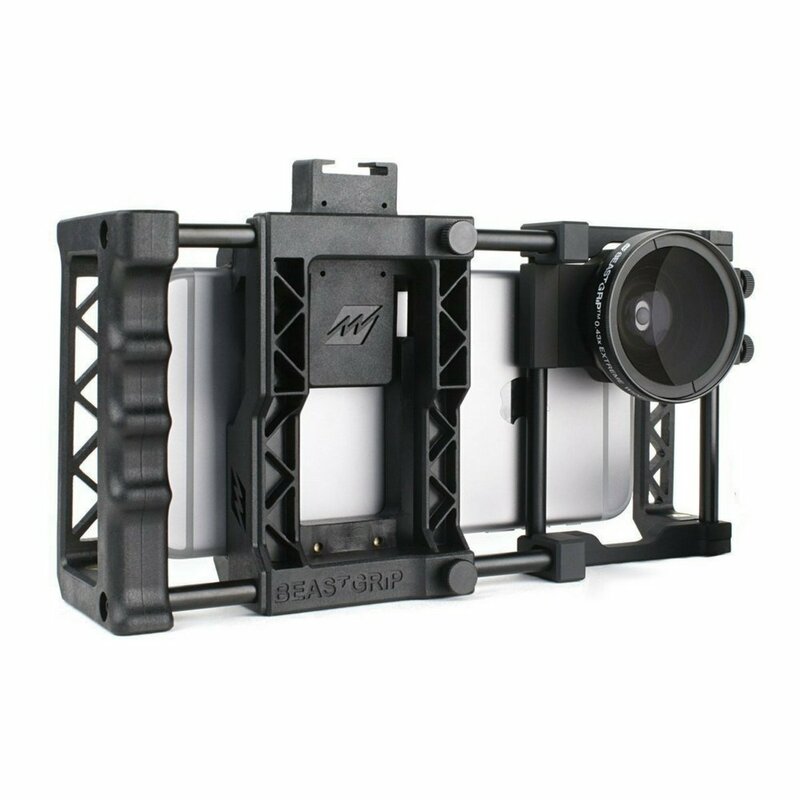 Beastgrip Pro + Wide Angle Lens Bundle – All Smartphones – Beastgrip Pro is Universal and adjustable working with virtually any smartphone on the market. With your smartphone installed you still have easy access to the USB and charging ports and your phone buttons. Modify the Beastgrip Pro to your personal preference with its removable lens mount and handle. Its industry standard photography mounts and ergonomic grip allow you to attach all common photography gear. With the included Wide Angle Lens you can capture 2X more picture then with iPhone’s built in camera. The need for proper lighting is an easy enough case to make. However, the particular lighting you will need to make your footage a success is another story and will require that you know what you wish to accomplish. Surprisingly, lighting devices for iPhones come incredibly cheap and so do great quality studio lighting kits. 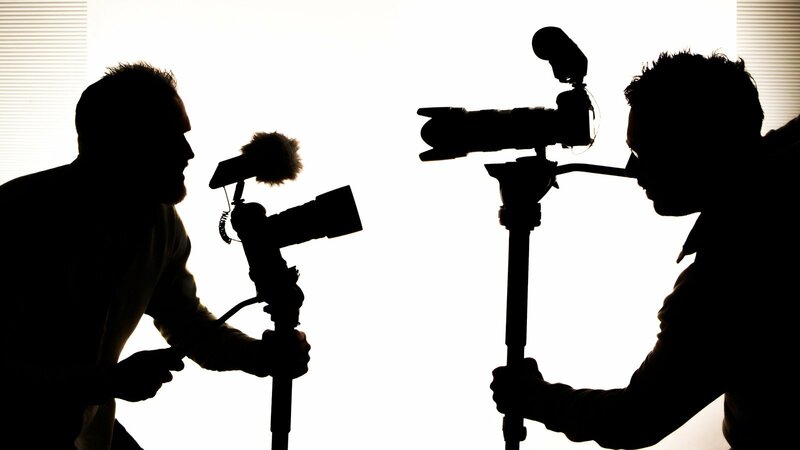 Whether you are making a film, producing content for your business or brand, or livestreaming on social media, there are affordable options that will help elevate the quality of your video. There are plenty of online resources to teach you lighting techniques. Further into this article we will send you to some of our favourite educators and influencers that offer free or affordable training in filmmaking and who will help cut your learning curve immensely. Directly below are some of our favourite picks in compact on-the-go lighting for iPhone and studio lighting kits for more dynamic light control. 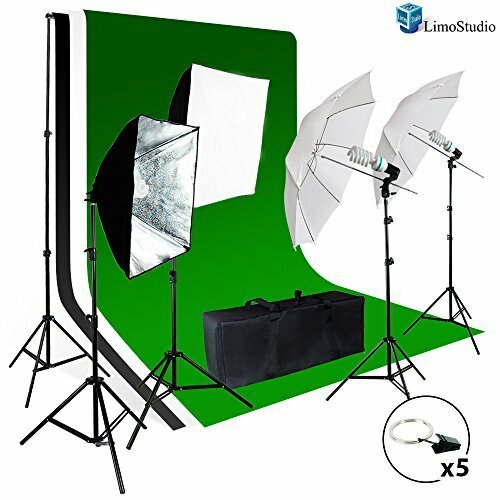 LimoStudio Photography Softbox Lighting Kit – This super affordable studio photography kit by LimoStudio offers two Light Holders with 24”x24” Softbox Reflectors made of high quality nylon offering 2 levels of light control. Two 86” umbrella flash strobe light stands at a maximum of 100” and two 85W CFL 6500K Daylight Balanced Pure White Light Bulbs. Also comes with a carrying case for easy mobility. 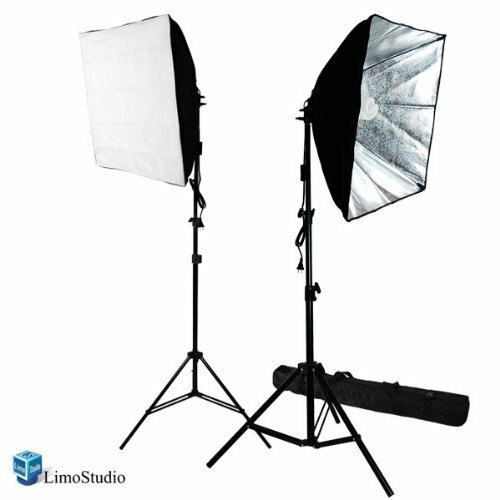 LimoStudio Photo Video Studio Light Kit – This affordable studio light kit from LimoStudio is an invaluable set of tools for any self-broadcasting professional, photographer or independent filmmaker . It is loaded with essentials like the Muslin backdrops for sharp presentations and post-production. At only 38lbs It is lightweight and practical for reinstalling at multiple locations. Click the button below for a full list of its contents. 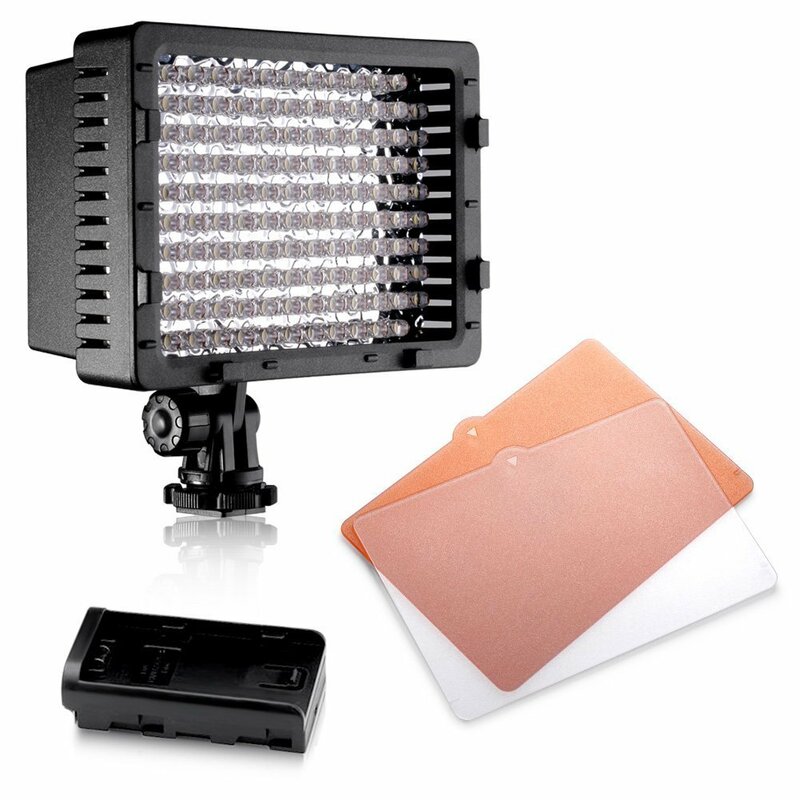 Neewer LED Camera/Video Light – If you purchase one of the cases listed above you can mount this battery-powered Neewer LED Video Light for excellent illumination and diffusion of light. It is light, durable and equipped with a dimmer switch to adjust the brightness to perfectly suit your scene. Raise and lower the lights level with a pivoting head and monitor the battery life with a power indicator. It’s a comfortable enough size to not be distracting, even when using an iPhone. Taousa Universal Clip-On LED Spotlight – This compact LED light is the perfect tool for on the go livestreaming and close filming. It offers 3 levels of brightness with an hour of juice at its brightest setting. The Taousa clip-on spotlight attaches very securely to all smartphones and tablets and can fit right in your pocket. It comes with a USB cable to power up. It gives off an impressively natural and professional light for such a small, low-cost device. Winky Universal Clip-On LED Spotlight – Another universal LED clip-on spotlight we love is from Winky. 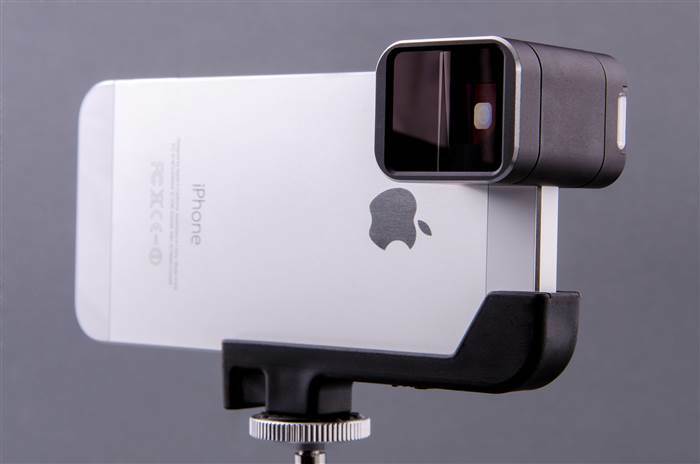 It gives continuous supplimental or side lighting that will take your iPhone filming to the next level. Clip it on to any smartphone or tablet and take it with you on the go. Charge it up via USB for a battery life of up to 3 hours. As these are super well priced you may want to consider picking up several. There are plenty of options for software that filmmakers are using today but instead of listing them all off we thought we would share with you a couple of our favourites that give extraordinary results and are affordable for literally any level of filmmaker. DaVinci Resolve is a professional film post-production software that combines non-linear video editing with highly advanced colour correction. Found in Hollywood and high-end studios around the world, DaVinci Resolve features creative tools and legendary image quality that will allow you to regularly surprise yourself with the outstanding results of your own work. While a full version of DiVinci Resolve will run up to $1000.00, they have an impressively loaded entry level colour correction version that is downloadable for absolutely free from their website. Check out the stunning example to the left filmed on iPhone and edited in this unbelievable free version. 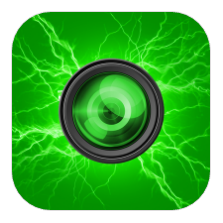 FiLMiC Pro is an absolute hit and is very well-known among smartphone filmmakers as it gives you many of the features of cameras that are hundreds of times the cost. FiLMiC Pro gives you amazing control and customization. Easily handle the focus, exposure, and zoom of your footage. Choose your frame rates, image quality, motion FX, audio gain controls, and platform for sharing your work afterwards. FiLMiC Pro is an extremely affordable app that you WILL USE almost ALL THE TIME when shooting footage with your smartphone. Filmora is amazing entry level video software for no-fuss content creators who are looking to simply put together attractive and engaging video without going down an endless rabbit hole. Filmora allows you to edit your footage and place attractive text and titles, overlays and filters, still and motion graphics all while offering music library of royalty free music to choose from. 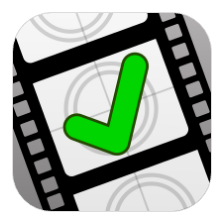 Get a frame by frame preview of your footage, control the speed, or play it in reverse. All in HD. Filmora releases collections of effects for purchase that allow you to transform your video into a retro 80’s flick or appear straight out of an 8 Bit video game. They have an extremely informative YouTube channel loaded with fun tricks and ideas for any filmmaker so consider subscribing. Filmora is totally affordable and is a top pick for Youtubers, small businesses and for personal branding. Available for Mac and Windows. 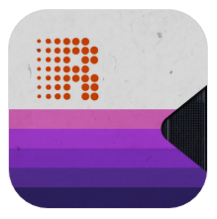 Record, edit and publish broadcast-quality audio directly from your iOS device. 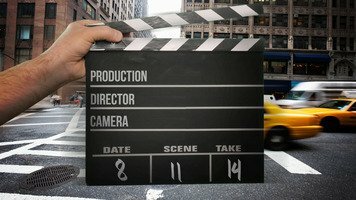 An editable production stripboard to help you plan every scene of a shoot. Track your shot-by-shot progress each day. Surprisingly advanced and feature-loaded digital slate, clapper board, shot log, and notepad. Achieve extraordinary, even detail on all your green screen footage and elevate your low-budget productions. This popular new app will make your footage look like it’s from Christmas 88′. Degrade the image to reproduce the effect of an old VHS video recorder. This is a comprehensive course of 28 lessons covering shot sequencing, storytelling theory, camera angles and finalizing your film. All CreativeLive courses are highly thorough, A-Z, and provide tons of value for their price. Definitely worth the time and investment. This is a free, 9-lesson course by FiLMIC Pro founder Neill Barham and noted cinematographer Jonathan Houser on getting the most out of FiLMIC Pro. The course has just over 2 hours of content that can be downloaded or streamed on any device. Again, it’s free. Get immersed into the entire process of guerilla filmmaking from envisioning, shooting and producing your idea — all within a limited budget. Learn to effectively DIY in creating a script, storyboard, scouting location, and cast your film with Ryan Connolly of Film Riot. This course will demonstrate the process of achieving the lighting you desire for your shots, both production and post-production audio techniques, workflow for editing, after effects and much more to help you get the professional results you’re after. A limited budget usually means that it’s up to you to wear many hats in a production, presenting a long learning curve to understand which hat is to be worn at any given time. The Self-Sufficient Filmmaker with Francesca Gregorini offer 17 lessons of between 5:00 – 26:00 minutes of easily applied strategies for balancing the demands of being a writer, director, and producer. This very affordable course with help you develop best practices in all aspects of indie filmmaking and have you on your way to becoming an efficient, productive and creative filmmaker. 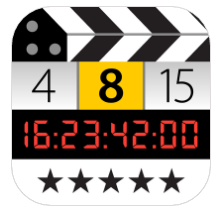 Are there any tools or resources that you have been using for your iPhone movie or filmmaking that have allowed you to achieve great results? Share them with us in the comments below!